LAFAYETTE, Colo. – The 40 teams competing at the May 19-21 USA Rugby College 7s National Championships have been separated into pools that will set the stage for the first two days of competition. Four pools of four teams have been determined for the 16-team Men’s Division I field, while the Men’s Division II and Women’s bracket will be made up of three pools of four teams each. ‘RugbyTown USA’ will be the backdrop of the championship weekend, as Infinity Park in Glendale, Colo., will host the USA Rugby College 7s National Championships for the first time ever. Men’s Division I pool play begins Friday, May 19, and continues into Saturday. The student-athletes competing in the other two divisions will first sink their boots into the grass of the 5,000-seat stadium at Infinity Park May 20. The three-day tournament will crescendo Sunday, May 21, with three Cup Finals in succession that will crown three National Champions in rugby’s Olympic code. 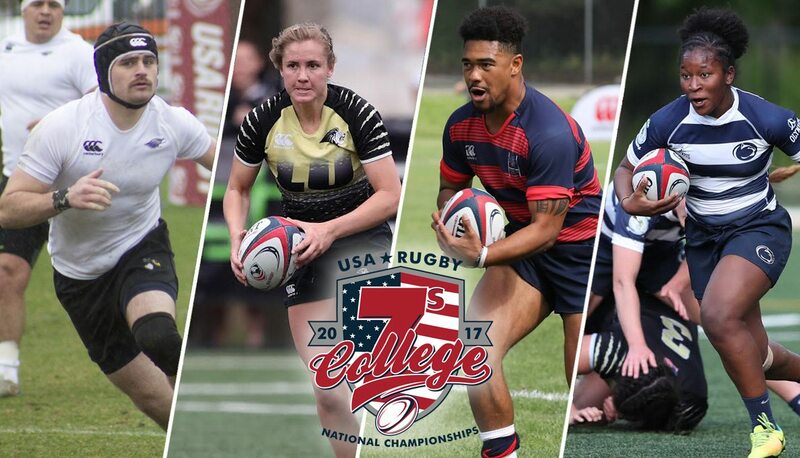 Each and every one of the 111 matches at the May 19-21 USA Rugby College 7s National Championships will be broadcasted live on The Rugby Channel. Last year’s College 7s National Champion, Saint Mary’s College, will headline Pool A of the Men’s Division I field less than two weeks after winning its third National Championship in 15s. Cup Finalists from 2015 are also in the 2017 field. Lindenwood, winners of the ’15 College 7s title in Denver, will be the favorites out of Pool B, while fellow Mid-South Conference side and 2015 runner-up Davenport University is pegged as the top seed in Pool D.
Nine of the 16 Men’s Division I teams represent D1A Rugby. Principia College will need to advance out of Pool A if it wants to win its second College 7s National Championship. The 2013 Cup Final winners share a pool with 2016 National Semifinalist in 15s Norwich University. St. Louis University and University Wisconsin-Whitewater make up one half of Pool C. Both teams reached the Cup Semifinals in 2016, and Whitewater is attempting to pull off what University of Minnesota-Duluth accomplished a year ago – win the Division II National Championship in both 15s and sevens. The 12 women’s teams making up the 2017 National Championship bracket could be the most competitive assembly of college teams for a sevens tournament yet. Fresh off of its National Championship win in the D1 Elite Final, 2015 College 7s Cup winner Penn State University has been placed in Pool C, while last year’s sevens National Champion, Life University, finds itself in Pool B. The Nittany Lions will be joined in their pool by reigning two-time Women’s Division II National Champion in 15s Davenport University. The College 7s runners-up from the past two years, Central Washington University and Lindenwood University, will play out of Pools C and A, respectfully. Three schools representing the National Intercollegiate Rugby Association will also be gunning for a National Championship at Infinity Park: Army, Central Washington and Dartmouth.